A 5-port LAN hub means you can connect up to 5 players or laptops to the DJM-TOUR1. Via Pro DJ Link you can share one source across up to 4 players - and if you're using rekordbox dj you get access to a host of advanced performance features on top. Tilt the screen to suit your preference, adjust the lighting or attach the display shad to protect the sun's glare when you're playing outside. The DJM-TOUR1 is Pioneers first mixer to have a KUVO Gateway on board so you can easily connect to KUVO and broadcast your set information, in real time, to fans around the world. 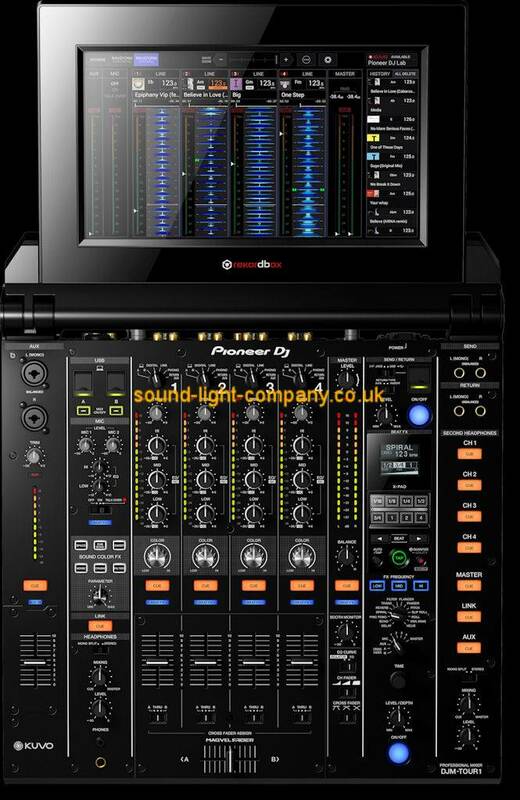 When you use Pioneer DJs rekordbox dj performance software, you can buy the rekordbox dvs Plus Pack to get low latency scratch control with music from your rekordbox library.